It is a small Mod adding dinosaurs and other animals 70 million years ago that lived in northern Canada. Enter a Minecraft universe that will seem to you to be perfectly normal, but with treasures and dangers. For 70 million years ago, life was not at rest. While the great theropods were watching their prey, many animals inhabited the forest, and if they were disturbed, in spite of their quiet pace, they defended themselves otherwise than a sheep or a cow! Enter a new world, possessing several new creatures of different shapes, sizes and behavior. Discover how the meat at the time could be good and nutritious. But, guys to you! For at the corner of the forest, a splendid Gorgosaurus will perhaps watch for you. And if he finds you ... He will not let you go! How do you tame dinosaurs? Brachyceratops need to have egg laying and building a nest and babies of it. will flying and marine reptiles be in it because those were with the dinosuars and giant bugs were there too. Is it possible you can make a 1.7.10 version? I still use 1.7.10 because the "Fossils & Archeology: Revival" mod is not yet updated to 1.12.2. Why Fossil and Archeology getting a 1.12 version too just follow them at Twitter and Instagram. Also it would be way to much work. Yes, and there is a big difference between 1.7.10 and after. The code and the method change too much. Did you find an Animator or did you found youre self a way. Okay the Gorgosaurus has some serious neck problem. Ohh and is it about a specific time period? 1. Gorgosaurus needs some work cause the Feeders at his neck look kind of bad its not worldchanging but they need some work. 2.The models are good but they are missing Animations. hope you find a way to do it yourself or to find some one hlping you out with that. 3. Almost forgot if you play peaceful for example to build in creative the dinosaurus keep flashing up. you should consider open sourcing your mod so that animators and or coders can make pull requests to it (submissions). Like for one increase the chance that dinos will spawn. do they have anims now? No. I don't know create the anims. When I will find a animator-coder who can help me ;). I could help with the coding part of that, but it depends on your formats. Which modelling method are you using? Yep, the dinosaurs do not spawn. In otherwise vanilla mc maybe, but not in my pack. With Minecraft Forge, with others mods, they spawn. Mod seems cool. I have it in my world. Haven't seen any Dino's yet. Is there a wiki? 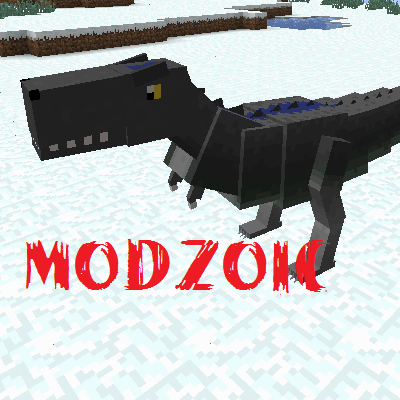 It is a small Mod adding dinosaurs and other animals from 70 million years ago that lived in northern Canada. Enter a Minecraft universe that will seem to be perfectly normal, but with treasures and dangers. For 70 million years ago, life was not at rest. While the great theropods were watching their prey, many animals inhabited the forest, and if they were disturbed, in spite of their shy disposition, they defended themselves unlike a sheep or a cow! Enter a new world, of several new creatures of different shapes, sizes and behavior. Discover how the meat from that time could be good and nutritious. But, guys, watch out! For at the corner of the forest, a splendid Gorgosaurus will perhaps watch for you. And if he finds you ... He will not let you go! ;) . Thanks for your mod!